Oh, gee. So now I have to summarize my trip to India, for those of you who’ve been foolish enough to read my columns about my planned trip there. Well, let’s just say this: I’m home now, and it’s great to sleep in my own bed and listen to our dogs snore underneath it. I’d wanted to experience India for many years, even though — decades ago — I met a famous Indian filmmaker who told me, “Don’t go there. You won’t like it.” I took umbrage at the time, assuming he meant I was too much of a pantywaist to handle his country. Well, in some ways, he was right. India is a tough country to experience, at least the way I did it, which was to take a tour with Intrepid Travel. This company aims to let you experience the real thing, local people, local trains, local buses, local pollution. You’re not tucked away in some grand hotel built by the British Raj, like some deluxe tours take you, where you’re waited on by Indians dressed in embarrassingly archaic uniforms who duck and bow as if colonialism had never ended. You’re standing at the desk of your tourist-class hotel, asking them to please turn the hot water on so you can take a shower. So, here’s my impression: India is bursting with color, full of monuments, palaces and temples so ancient it’s hard for us to even grasp them as Americans whose oldest history only dates back a couple of hundred years. That’s not even enough to be considered historic there. Seriously, it’s not. Most people are kind. The food is amazing. There’s a reason that Columbus ran into the Americas while he was looking for a better way to get spices from India. That reason is that Indian spices make life worth living. I never had the slightest idea what type of food I was ordering off any menu. I’d just point and say, “This one.” And whatever they brought me was always delicious. If there were a better word than delicious, that would be it. When I took an Indian cooking class, I discovered why: They cook everything in massive amounts of oil and ghee, which is clarified butter, along with tons of sugar. And they use fresh whole spices in everything. Even though I ate vegetarian food on the entire trip, I still gained weight, because I couldn’t stop eating. I simply could not leave one bite of food on a plate. Food in India is amazing. Here, the author is eating who knows what at a restaurant that specializes in South Indian cuisine with her tour group from Intrepid Travel. Wandering around thousand-year-old temples and massive palaces was a surreal experience. As was wandering through a small village where we were like rock stars, because they seldom see tourists. People would appear out of nowhere and want to have their pictures taken with us. Kids would stop playing cricket in the street to surround us, just to say hi. So what was hard? Well, firstly, I’d have to say the air pollution. I really, really don’t want to see the air that I breathe. India supposedly has pollution controls on cars, but there’s so much corruption that no one actually bothers to comply. It reminded me of the bad old days before unleaded gas, when the air hung yellow in the summer in Pasadena. Remember that? Well, that’s India. Even in the Northern India countryside, you could see the air, because of dust and things burning. In Varanasi — India’s holiest city — that includes the bodies of the departed. And that city has a very peculiar air quality and odor all its own. And, yes, the people. They are kind and funny, but there are too many of them — 1.3 billion, many of whom were in the northern part of the country I visited. In a land mass one-third the size of the U.S. I used to think I was a fairly aggressive driver. I can fend for myself in Tijuana traffic. But every day in India makes Tijuana look like a Sunday morning in rural Iowa. Traffic lanes and lights are only a suggestion. Drivers honk their horns every 18 seconds. Seriously. I’m not kidding. If a driver in India broke his horn, he couldn’t drive. Often, I would just close my eyes. I’d rather not know if I was about to die. Like the Indiana Jones ride at Disneyland? It lasts four minutes. Imagine three hours of that rocking and bouncing and pounding, which is what it’s like to travel 60 miles on a potholed Indian highway, dodging cows and goats and monkeys and stray dogs, not to mention motorcycles, cars, pedestrians and tuk-tuks. And then there are the cows wandering the streets. As a rancher’s daughter, this was a hard one for me. I wanted to jump out of the auto rickshaw and herd them all up. As you may know, cows are considered a living representation of the Hindu cow goddess, so no one eats them, though they drink their milk. The McDonald’s I visited in Delhi had no beef on the menu — but a corn and spinach burger. Yes, you heard that right. Corn and spinach. I had to try it. It wasn’t bad with ketchup. India is a huge country with many disparate regions. I only saw a small portion of it, so I really can’t generalize. The delicious masala chai tea made all the hardships worthwhile. Will I go back? Well, right now it’s too early to say. I’m just glad to be back in a neighborhood where I can’t see the air, and people are more likely to flip you the bird than blow a horn at you. And I have unlimited hot water when I turn on my shower. One of the great benefits of travel is so you can appreciate your cushy life back home. And that’s never been more true for me than now. So, thanks for being part of that. And if you want to go to India, by all means, go. You’ll never forget it. 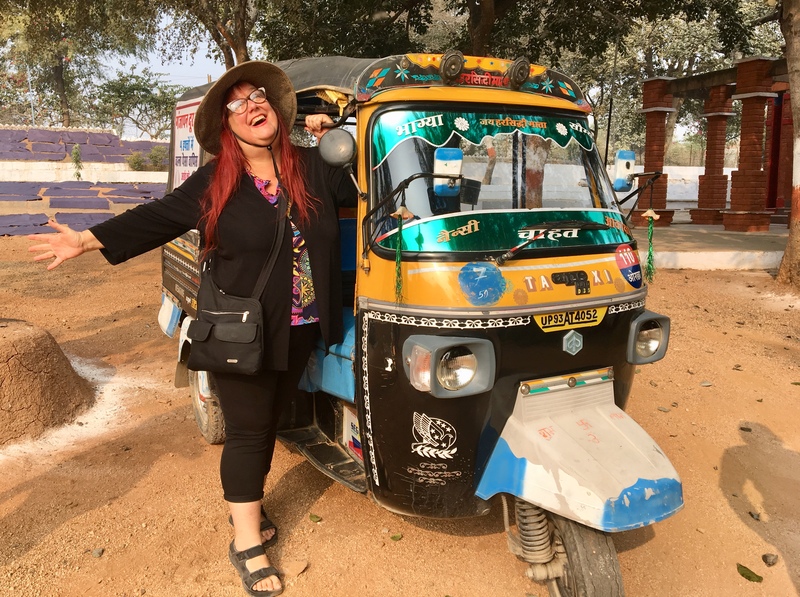 Columnist Marla Jo Fisher, aka the Frumpy Middle-aged Mom, at the Taj Mahal, Agra, India in January 2019. The sun set over the desert. I took some time alone from my fellow travellers and walked about the sand dunes watching how the wind altered the surface as it delicately brushed the grains around, sculpting seemingly impossible to recreate patterns. I sit and wonder… when we have the chance to forge our future why do we choose the path we wind up on? how much of it is what our parents want? how much of it is free will? how does our community guide us to a future?